I joined the Saulteaux Hiking Club on this hike along the Tom Allinson Side Trail. On this outing we hiked just along the shoreline portion of the Tom Allinson Side Trail starting from the Pebble Beach end of the trail. This trail is part of the greater Voyageur Trail system and connects to the Cros Cap portion of the trail. The trail is named after a Voyageur Trail Association member who passed away in 1997. Follow Maki Road/Red Rock Road for about 13 km, past the Prince Wind Farm, until you reach Lakeshore Drive/Pebble Beach Road and turn left. Drive 4.8 km and look for the trail on the right. 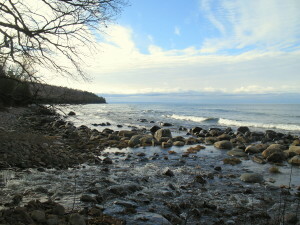 The trail follows the shoreline of Lake Superior for just under 3 km until it reaches a creek. I was fascinated by the layers of flat sandstone you could see as you walked along the shoreline, I hadn’t seen it look quite like this before. There is a little waterfall along the creek about 250m from the shore if you want to have a look. There is a picnic area along the creek about 50m from the shore where we took a break before turning back the way we came. 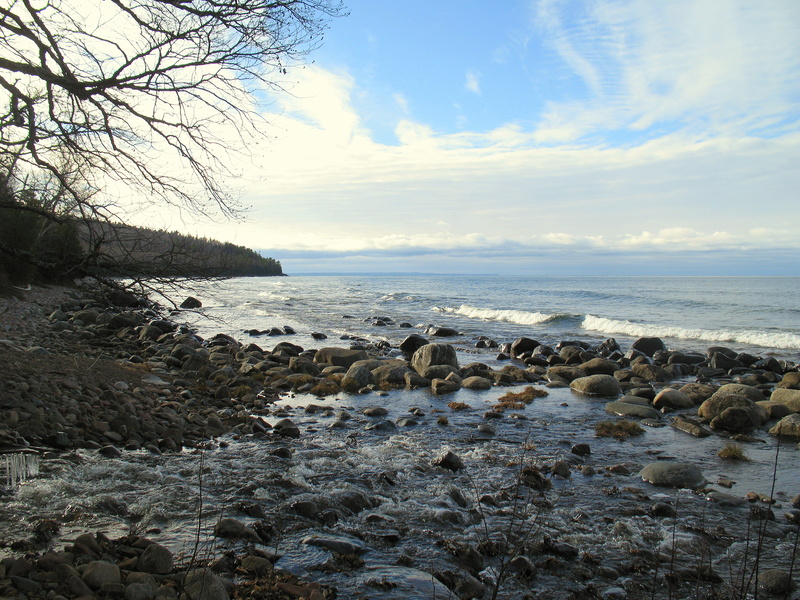 You could continue along the trail from the picnic area as it turns away from the shoreline and continues south for another 6km where it meets up with the Gros Cap section of the Voyageur Trail.